Clonazepam is a controlled substance and member of the benzodiazepine class of medications. It is often used as an anti-anxiety and anti-seizure medication. 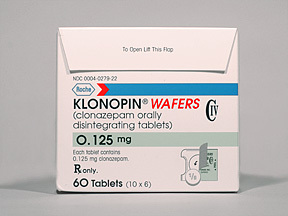 Other forms of Clonazepam are known as Ceberclon, Klonopin, Valpax or Ribotril. Clonazepam may be used solo or in conjunction with other medications to control specific types of seizures. It is also effective in the alleviation of anxiety and panic attacks, restlessness, and the need for constant movement, both symptoms of akathisia, which can be caused by antipsychotic medications, have also been treated with Clonazepam. Acute catatonic reaction, in which a person’s speech and movement is abnormal or nonexistent, is a condition that has also been treated with Clonazepam.